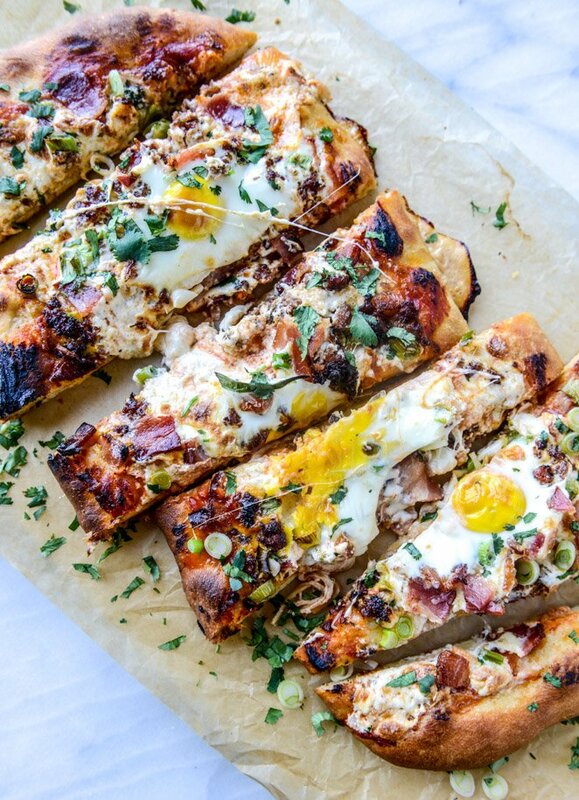 Say hello to all of your breakfast dreams. Because that’s what it is! I can’t help it. Just check out all of the layered goodness below. Not to mention the fluffy dough. I rhyme? and my favorite of all the ingredients ever, eggs! The amount of eggs in my life is borderline ridiculous. My top three consumed foods at the moment would probably be eggs, avocado and cheese. Not often together but delicious together. 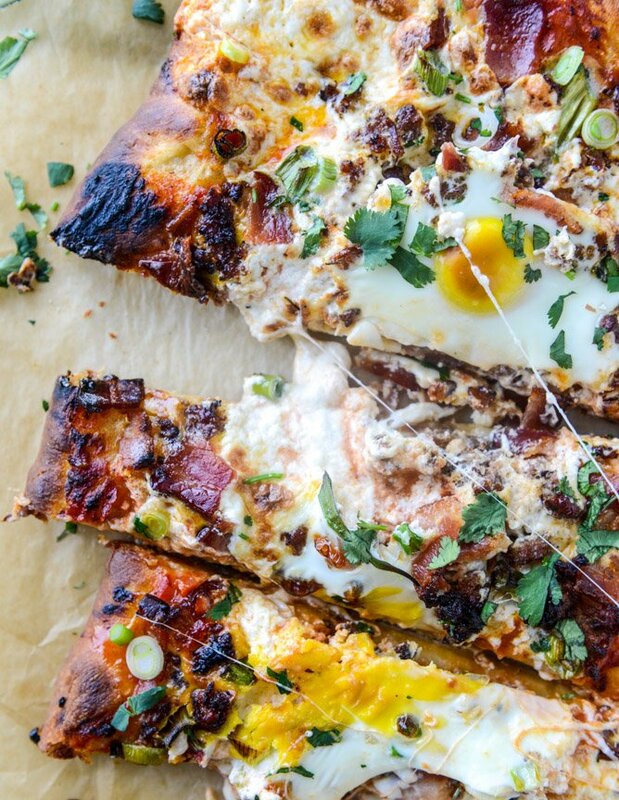 I’ve had breakfast pizza before but it’s usually missing one big ingredient: the sauce. Which should come as no surprise since sauce isn’t really my thing, HOWEVER… I’m changing. I’m starting to want more sauce on my pizza, want sauce with the cheese, with the eggs on top and the scallions and the crunchy bacon. It just sounded life changing. No way was this happening without some tomato goodness. P.S. I think it was these saucy baked eggs that changed everything. My skepticism was also high on the burrata + pizza combo. I adora burrata (is there anyone who doesn’t?! ), but how would the cream-stuffed mozzarella work on pizza? Would the cheese end up being too wet and not cheesy enough? Would it be runny? Would I regret not using provolone or my go-to, fontina? It turns out that it’s option D: none of the above. As you can see, the cheese is incredibly melty and wonderful and stringy in a good way and, for lack of a better work, cheesy. Plus, is mixes in with the sauce and almost acts like a bit of a cream sauce on certain bites which made my brain practically explode. My tastebuds were already freaking out so the brain was next. Clearly. The eggs are your timer here. How do you like your eggs? I like my eggs every which way (EXCEPT! runny scrambled eggs, aka, barely cooked eggs, and I just cannot deal with runny whites either) and don’t mind if there are runny, soft or film yolks on the pizza. I’ll switch it up depending on what I feel like that day orrrr if I set the timer too long on the oven. Whoops. What I’m super excited for is warm weather so this can be made on the grill and served outside on a Saturday morning. It would be lovely at your Easter brunch, you can make the dough the night before or heck, even use some store bought dough. Measure out your toppings the night before and prep some things if possible (cook your bacon, your sausage) and it will barely take any time to make come eight AM. It is 100% calling your name right now. 3 or 4 large eggs, or however many you’d like! After the dough has risen, punch it down and place it back on the floured surface. Using a rolling pin or your hands, form it into your desired shape (sometimes I use baking sheets and do rectangles or free form pizzas – this specific dough will yield one pizza large enough to feed about 3-4 people) and place on a baking sheet or pizza peel. Place the towel back over the dough and let sit in the warm place for 10 minutes. Brush the pizza dough with the olive oil. Cover it with the marinara sauce and sprinkle with the garlic cloves and red pepper. Pull apart the balls of burrata and evenly disperse it over the dough. Top with the sausage, bacon and scallions. Evenly crack the eggs over top. I like to find “pockets” where the eggs can sit nicely between the toppings so they don’t run off while cooking! Bake for 20 to 25 minutes (or around 15 to 20 minutes if using the pizza stone) – until the eggs are set to your liking. Remove the pizza and cover with the herbs and chives. Slice and serve immedaitely! Grapefruit mimosas on the side please.